Historically, the city of Nitra was one of the most important centers of Jewish life in Slovakia. First mentioned in a document from 1113 (the Second Zobor Deed), the Jews maintained a prosperous community throughout the Middle Ages. They were expelled, but they re-established an organized Jewish community in the seventeenth century. During the second half of the nineteenth century Nitra had more than 3,000 Jewish residents, one quarter of the total population. There were separate Orthodox and Neolog communities. The city remained an important center of Jewish learning until September 1944, when the famous yeshiva of Rabbi Samuel Unger was closed down – it was one of the last yeshivas to function in Nazi-occupied Europe. In 1940 Nitra was home to 4,358 Jews; most of them were killed during the Holocaust. There is still a small Jewish community active in the city. The synagogue was built in 1908-1911 for the Neolog Jewish community. 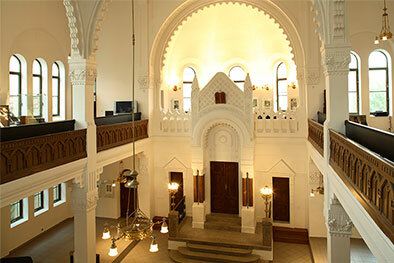 It was designed by Lipót (Leopold) Baumhorn (1860-1932), the prolific Budapest-based synagogue architect. Located in a narrow lane, the building is a characteristic example of Baumhorn's style. A mélange of Moorish, Byzantine and Art Nouveau elements, it faces the street with a two-tower facade. The sanctuary is a domed hall supported by four pillars that also support the women’s gallery. After more than a decade of painstaking restoration by the municipality of Nitra, the building is now used as a center for cultural activities.